ISO file can be extremely useful when you need to install an operating system or even a software utility. Essentially, an ISO file is a copy of all the content from a DVD/CD/BD in archived format. The files inside can be anything: media files like music and videos, installation files and so on. The image file itself is uncompressed, and the structure it uses to store the data will be based on the file system that was on the disk that contained the original data. The problem with ISO files is that you can't view the contents or even open the file without special utilities or native support. In Windows, native support for ISO files only came with Windows 8, which means older versions like Windows 7 require tools to be able to do this. In Windows 10 there is native support, but you also have other utilities that allow you to view the contents of an ISO file without having to burn it to a disk or drive. The easiest way to view the files of an ISO file on Windows 10 is to use its virtual drive mounting capability. This feature allows you to mount the ISO file on a virtual drive rather than a physical drive or a disk. The advantage is that you don't have to burn the file to a disk to see the content, so no diskc would be wasted for this purpose. However, there are often problems with mounting the file on Windows 10. It could show an error if the ISO image wasn't created properly in the first place. If you're facing such an issue, then a third-party application may be required to see inside the ISO file. Step 1 : Download the PFMAP software on your Windows 10 PC and install it. 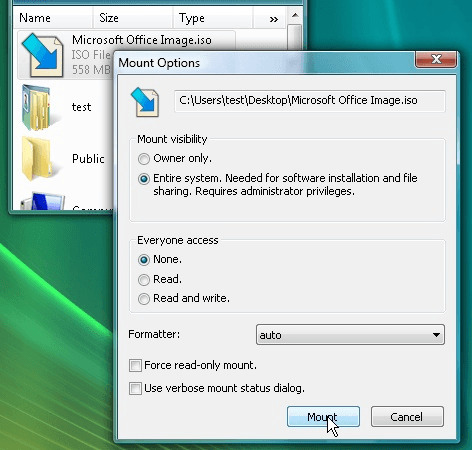 Step 2: Once the installation is done, you can simply right-click on the ISO file in File Explorer and click on "Mount". You'll notice that the ISO icon for the file is now replaced with another, meaning that it is now a file folder. Double-click on this and the file will open, showing you the contents of the ISO file. Step 3: If you don't need to copy or extract anything, simply right-click on the main file folder and select "Unmount" to change it back into the ISO format. 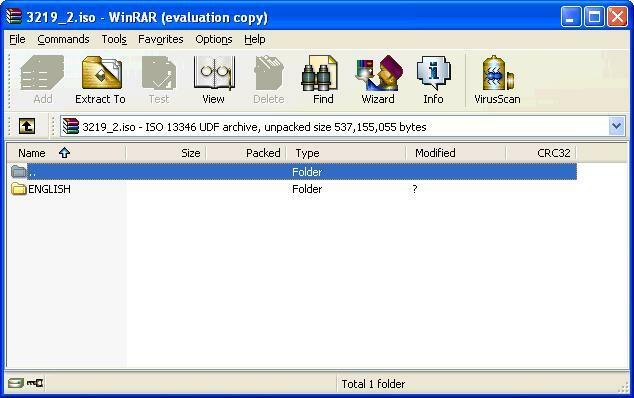 A lot of people prefer this utility over the next one - WinRAR - because the latter is known to create some issues while extracting files from an ISO image. Nevertheless, it's a popular tool for the purpose. WinRAR is essentially a paid utility, but there's a long trial period before you need to pay anything. In certain countries like China there's also a fully free edition available. It's basically an archiving tool for compressing files, but it allows you to view the contents of an ISO file so you can copy or extract it. Step 1 : Download and install WinRAR on your Windows 10 PC. Step 2: Navigate to the file and right-click on it, then "Open with…" and select "WinRAR". Step 3: You should now be able to see the contents of the image file in the form of subfolders and files. Just close the WinRAR application when you're done. As mentioned, there are certain issues you may come across while using WinRAR. The problem is generally seen when the files in the ISO image are corrupted, but it can also be because of the software application itself. If WinRAR doesn't work for you, then try the method described below. 7-Zip is an open source archiving and file compression software utility that has gained tremendous popularity among Windows users. There's also a modified version called Easy 7-Zip that has the same features but is easier to use. You can use either of them to view the contents of an ISO file. Step 1: Download 7-Zip or Easy 7-Zip on your Windows 10 PC and install the application. Step 2: Launch the program, after which you will see a navigation windows similar to Windows Explorer. Step 3: Find the ISO file that you want to view, right-click on it, go to 7-Zip and then click on ‘Open archive'. This will open the ISO file and you will be able to see the folders and files inside. There are also other things you can do with Easy 7-Zip, such as delete archive files after extraction, have the software open the output location and even close the program automatically once the extraction is complete. Step 1: Go to "Applications" in the Mac Finder and select "Utilities". Double-click on "Disk Utility". You can also get there by clicking on the "Go" menu in Finder and then clicking on Disk Utility from there. Step 2: Once it's open, go to the File menu and look for the Open Disk Image option that you see there. 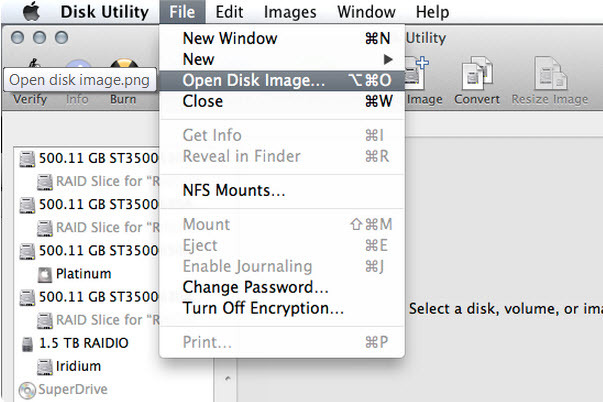 Step 3: This will open a navigation window where you need to find the ISO file and select it. Then click on ‘Open' on the bottom right hand corner of this window. This will extract the contents of the ISO file and copy it to a disk image on your desktop. Go to your desktop, double-click the disk image and you'll see all the contents of the ISO image there. You can try using 7-Zip for Mac if the Disk Utility method doesn't work for you. There are also several alternatives to this software, such as The Unarchiver, WinZip for Mac, Zipeg and so on. All of these are for the macOS environment and their usage is very similar to how it works on Windows, although you may see significant UI differences.